Another week, another 'Day in the Life of'. Welcome back! I am so excited this week to have Lauren who writes at From Blacktop to Dirt Road joining us. I have been following Lauren's blog for a couple years now and it is truly an honour to have her writing for A Beautiful Alarm. Her writing is incredibly relatable, deep in the every day true moments of Motherhood, and flowing with encouragement. 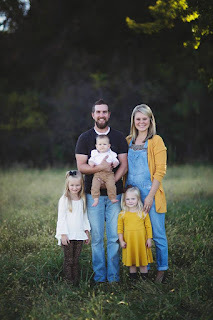 Specifically she blogs about farm life for a stay-at-home mom with 3 littles, being in the trenches of Postpartum Depression, and more about family and marriage life. She does not hold back and keeps things as real as they can be. You can find her writing on her Facebook page and follow along with her every day life at her Instagram account. I will let Lauren tell you more about her self and her journey... read on! Hey, hey mama friends! 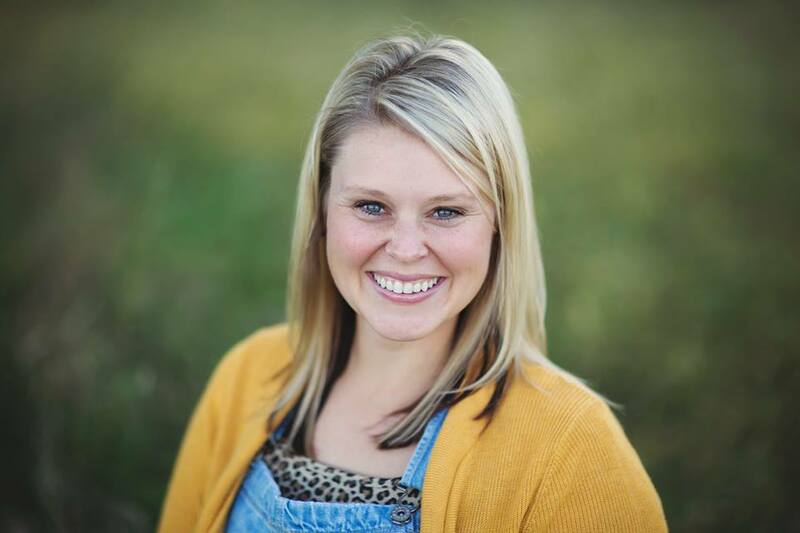 My name is Lauren Eberspacher and I am the author of the blog From Blacktop to Dirt Road, where I blog about all things faith, farm, and old-fashioned homemaking. Growing up in the suburbs of Kansas City, I found myself in love with a farm boy from Nebraska, which took me from the blacktop of the city to the dirt road of our grain farm. I'm a stay-at-home mom to my three small children, Nora (5), Andi (3), and Deacon (9 months) and 'learn-in-progress' farm wife to my bearded farmer, Eric. We are in the middle of harvest right now, so I'm going to share with you about what a typical "harvest day" looks like for us, along with the everyday hurdles that I face while I battle postpartum depression. PPD is such a silent disease, but seeing how it affects everyday life is something that I would love to shed light on today. So let's go! We got Andi her cereal, turned on Mickey Mouse, and crawled back into our beds. Honestly, I swore I would never be "that" parent, and yet here I am. It's a glorious thing when a bowl of cereal and a cartoon can buy you an extra 45 minutes of sleep. At 6:45, I hear the coos of my little guy through the monitor. 6 months ago, I would have rolled over and pulled the covers up over my head, at hearing his tiny voice, begging my husband to go and get him. But today is different. Today I still have to tell myself to get out of bed, but I do it with hope. For someone with postpartum depression, this can be the hardest part of the day. And this morning I was grateful that it was easier than yesterday. Progress, ya'll... Progress. After walking into the bathroom and taking my Lexapro, I walked into Deacon's room and he smiles at me. Every morning I sing "Here Comes The Sun" to him as I pull him out of his crib and change his diaper. I've chosen a special song for each of my kids, and this is his. It has so much meaning to me. By 7:30, everyone in the house is up and the day has officially gotten crazy! All three kids have had breakfast, my husband grabs his dusty ball cap, I pour him a thermos of coffee and give him a kiss as he walks out the door to his farm truck. This is another hard moment for the mama with PPD - when I'm left alone. Today I have to slow down my breathing as I see him drive away. Today was going to be a busy day, and knowing I was going to be on my own until after midnight seemed daunting. But I remind myself that I was created for this day - to be my baby's mama, to be his helper, and to be a woman who chooses to be grounded in His Truth. "God did not give me a spirit of timidity," I remind myself as his truck disappears over the hill. "He gave me one of power, and love, and self-discipline. I will be who I need to be in Him today." Another small battle for this PPD mama won. It's 8 am now and I already need to start on lunch. I get my water boiling on the stove, get the kids dressed for the day, and get to work. Veggies to chop, sweet tea to make, and dessert to start on. Today the guys are harvesting the bean fields around our house, so instead of bringing an entire meal out to the field in my van, they are going to come in for lunch. And today, that is such a blessing! On the menu for today is cheesy corn chowder, chopped salad, homemade bread, and brownies. My girls always sit up on the kitchen counter tops while I cook, so I'm never lacking in company. The baby plays at my feet with spatulas and bowls and constantly wants to be picked up so he can see what's going on. My goal is to have lunch ready by 11:45, so I work intermittently though the morning to get it done. In between stirring my soup and baking bread, we pretend we are camping, put together puzzles, nurse the baby, and have snack time. Our harvest mornings might seem chaotic from the outside looking in, but taking things one step at a time is key for me. One of the things that I've learned in motherhood, and especially since having PPD, I can't have too many expectations. Spills happen, poopy diaper blowouts will happen at the most inconvenient times, and anxiety needs to be met with grace. This morning I had to phone my husband after an overwhelming moment, having him tell me to breath, knowing that I could handle the situation at hand. I got off the phone with him and retreated to my laundry room; sitting on the floor I asked the Lord to calm my heart and redirect my mind. I have a small bowl of chocolate on my laundry room counter top and it always meets me in my most anxious moments. One Hershey's Kiss and a few sips of coffee later, I was ready to get back to my morning. A few months ago, you would have found me on that laundry room floor in tears, unable to go back out and take care of my kids. But today, I have a strategy, and my strategy always begins with prayer - even when I don't feel like it. Prayer has been a way to significantly calm my anxious heart, as has reciting scripture and eating a piece of chocolate. These may seem like easy things for the normal mama to do, but for someone with PPD, making them happen can be hard. Yes, today I had to choose, but it was easier today than it was 6 months ago. Thank you Jesus! It's noon and the guys come in for lunch, there are 4 of them plus my three kids and myself, so it's a full table! We talk about the field they are on and make a game plan for the afternoon; which field they will be on, if I need to help them move machinery, etc. Another cup of coffee poured, another kiss from my farmer and they are out the door. The kids help me clean up lunch, I put the baby down for his long afternoon nap, and I sit down at the computer to do a little bit of work. The kids are playing in the basement while I work for about an hour. Writing has been unbelievably therapeutic for me as I have walked this road of PPD, and it's turned into an incredible way to encourage other women going through the same thing. At 2:45 the girls come upstairs and are ready for a snack, apples and peanut butter. We play through the rest of the afternoon, and start to get Eric's dinner ready at about 5pm. Tonight I make him a deli sandwich, throw in an apple and some chips and a few protein balls and brew him another pot of coffee. It's windy today, so they will be harvesting beans well into the night. Last week they were able to go until 2am, so I'm suspecting tonight will be the same. Late nights alone are hard for this mama. I miss my husband and so do the kids. He works so hard for us and I'm so grateful. We walk out to the field and deliver his dinner at 6pm, then come back in for baths. This is when my anxiety and frustrations really start to ramp up. It's the end of the day, - I'm tired, the kids are wired, and I'm ready for the day to be done.... to be alone for a few minutes. But this is when I cling to my scripture the most. "Be strengthened with all power, according to his glorious might, for all endurance and patience with joy." Again, the practice of reciting scripture saves my PPD mama heart. Another deep breath, another few verses, and my mind shifts. It's now 8 pm, and this is the part of the night where I can either cry or laugh...and I've gotten to the point where I've chosen to laugh (most of the time!). “OK guys, time for bed!” My girls run down the hallway towards their rooms. After tucking each of them in and giving them kisses, I walk out into the hallway and stand in between their bedrooms, and begin to say our bedtime prayers. As I stand there and nurse the baby, the girls start calling out song requests. I sway back and forth in the hallway until that baby falls asleep and the girls stop calling out for me. I look down and the baby is asleep. Oh my goodness, I did it!! They are all asleep!!! I lay my little guy down and walk out onto the front porch. I can hear the hum of the combine over the hill and I say a prayer of thanks and safety for my husband. I feel my anxiety start to rev up, but I pause to take a deep breath. The air right now is crisp and cool and smells like crunchy Fall leaves. It's a beautiful way to end my day and just one of the subtle ways that God romances my heart during this busy season. It's 9 pm and I end my evening on the couch, returning emails, blogging, and updating all of my social media accounts. I absolutely LOVE to write and connect with my readers, so this is a really special time of the day for me. I continue to be blown away at the different opportunities and platforms that God has allowed me to have through my little corner of the internet. It is truly a gift to be able to encourage other women in their walks with the Lord and provide them with parenting humor along the way. Alas, it's 1 am and I'm gently being nudged by my husband. He is in from the field and I've fallen asleep on the couch once again. We crawl into bed and snuggle in close - it's the best part of my day, being close to this man. And tomorrow I get to wake up and live this crazy farm life with him, and PPD, all over again.